I have pictures of him on the wall in my classroom. Year 11 fondly call him 'that Egghead'. I like this shot. He almost looks like he could be an Oxford don - the awkward hands, the obvious aversion to being photographed - but then the you spot the concrete pillar, the glass-fronted, probably 60s new-University build behind him and realise he's in Hull. I love that: “I don’t want to go around pretending to be me.” Can I relate that to weddings? Probably. Should I? Well I’m going to, so there. Here's the issue. You see, I have a thing about traditional wedding suits. By saying I have a 'thing', I don't mean it in the same way as I had a 'thing' for John Leslie in his Blue Peter days (yes, Ulrika, I know) or a 'thing' for River Phoenix circa 1992. I have a thing about wedding suits. Oh, the subtle nuances of the English language! And the thing is this: I can't bloody bear them. I don't like tails - too fussy. And I know they're uber-popular and some people may hate me for this sweeping condemnation, but I don't like cravats. Waistcoats? Well, they're passable as long as they're made in the same material as the suit and not some cream-and-red swirly-patterned monstrosity. They match the colour scheme? Hmm. But they're vile. They look like something you'd use to upholster a sofa. Wikipedia says that morning dress is now "rarely worn, used generally only for weddings, some official government or Royal functions, races such as Ascot, and as uniform at some of Britain's most traditional schools such as Eton." Royal functions? Ascot? Eton? Hang on a minute. These occasions don’t, for me, qualify as real life. Fair enough, so arguably a wedding isn’t ‘real life’, either. Granted, in real life I don’t ordinarily swan about in a white dress or carry a bouquet around with me. Hell, some days I forget to wear mascara. But what I want to know is this: what is it about a wedding that makes us frightened to be ourselves – all be it a slightly more polished version of ourselves? Why do we end up relying on a fairly narrow range of wedding conventions which have been deemed by God-know’s-who as appropriate but stray from them AT YOUR DOOM. YOU HEAR ME? DOOM. DOOOOOOOOM. Renounce these conventions and there’s a cacophony of suppliers and caterers and magazine articles howling in incredulity. Really. Strain your ears. If you’re having unconventional wedding thoughts, you can probably hear them. But I don’t want stupid bows on the back of chairs, and I certainly don’t want them at £3.70 a seat excluding VAT. Plus, my sister really liked that bloody necklace, alright? And, if it’s OK with you, I’d rather saw off my own arms than eat a three course dinner with a roast main. Ta very much. Back to the suits. 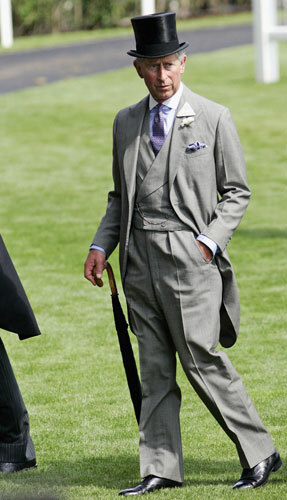 Here's Prince Charles, looking a bit like a pillock. In a morning suit. Coincidence? OK, so I chose a picture of him wearing a top hat and walking with an umbrella. He was bound to look ridiculous. But it's fine for him, and you know why? He's royalty. He's supposed to look like that. This is Prince Charles being himself. I’m cool with that. What I’m not cool with, though, is that I’m finding there’s an omnipresent struggle in organising a wedding. I want to be true to myself. I don’t want to feel like a fraud. I don’t want to feel uncomfortable and I want to look like me. Albeit a groomed and pretty version of me in a special dress and killer shoes. So I’m afraid it’s “no pretending to be me” on 30th July next year. It’s just going to be me. Thanks, Larkin. ooh I think I'm going to enjoy reading your blog. Quotations and short wedding dresses - yeah to both! I totally agree with you about morning suits, I think grooms look like they are being drowned by them! I'm pretty sure even my 6ft2 boy could be made to look short by a morning suit! At least Charles was wearing a matching waistcoat in that pic rather than a swirly curtain design! Liking your blog and looking forward to reading your RMW posts. When choosing a suit for men the color is very important factor to be considered. That would help to look good.